A brief discussion of leather care is probably overdue. This has been brought to my attention lately by several people expressing fondness for their leather wristbands or necklaces with words to the effect that they, "Never take it off!" They sleep, eat, bathe and live with their favorite accessory 24/7. Wear it a lot. Wear it most of the time. But please, when you bathe, shower, swim or sauna, take it off! Most soaps are drying to leather, as is chlorine or salt. Repeated soaking, especially with warm or hot water, will remove many of the tanning chemicals that keep your leather from becoming brittle. This leads to a breakdown of the grain (which can destroy the appearance of a fine leather accessory) and hastens the weakening and death of that favorite item. With a small amount of proper care, leather goods can and should last for many years. Methods of care and cleaning are determined by the type of leather. 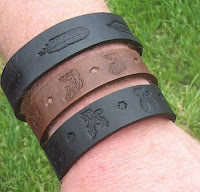 Smooth-grained vegetable-tanned cowhide is what most people think of when they think of belt leather. This is the type of leather that's used for tooled items; we'll cover that today and save suede and deerhide for another post. Cleaning: This is not something you'll normally need to do with belts or wristbands - the patina that comes with age is generally considered desirable. 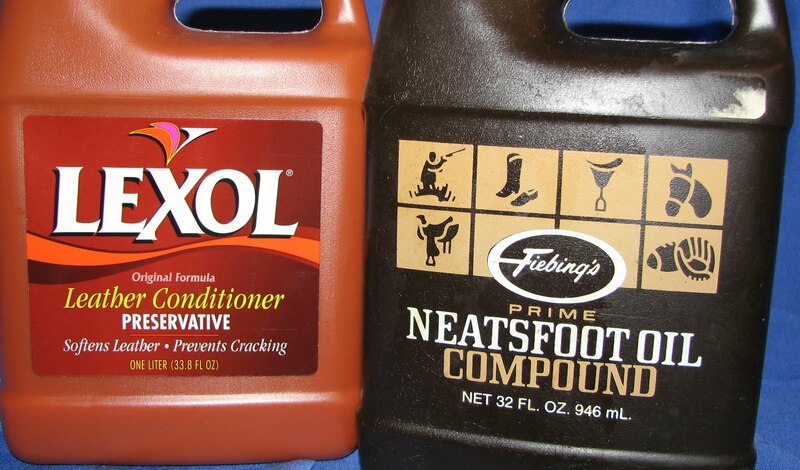 However, should you encounter a mud-bog or other serious dirt issue, or for smooth-grain footwear, a conditioning cleaner such as saddle soap or Lexol PH is strongly recommended. Apply as directed with a soft cloth and tepid water, rinsing thoroughly. A soft brush, such as a toothbrush, can be used for stubborn dirt. You should wash the entire surface - spot cleaning can lead to just that; spots! Allow the item to dry completely in an airy location away from heat sources or direct sun. Of course, there are some types of stains that will permanently mar your leather; no amount of cleaning will remove grease or ink, for example. Try to avoid staining your leather with those things! 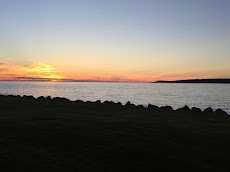 Conditioning/Protecting: This should be done occasionally, particularly after cleaning or for items that get a lot of wear, such as an everyday belt or favorite wristband. My first rule for this is shoe polish is for shoes!! Do not use it on belts, wristbands, purses or wallets - you will not be pleased with the results! My second rule is leave the back alone! No conditioners or sealants should be applied to the backside of full-grain cowhide - leather needs to breathe! 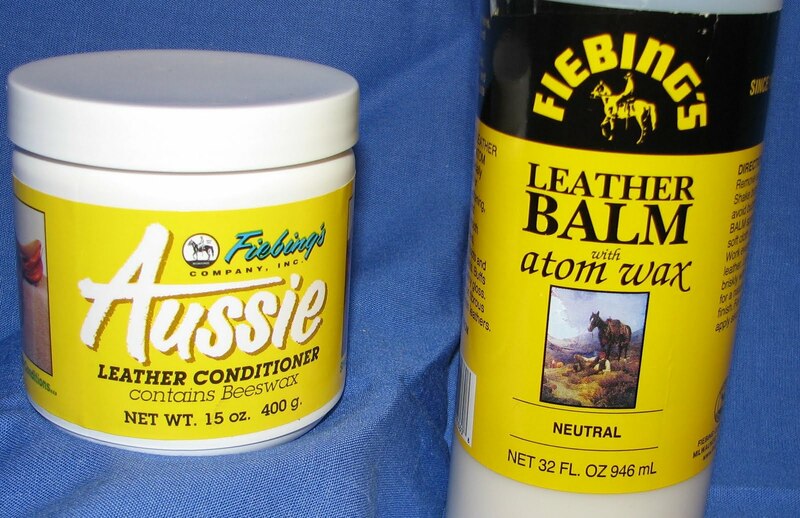 There are many great leather conditioners on the market. Some, such as Neatsfoot oil, are for oiled leathers only. If you use it on waxed leather you'll get blotching and clouding. 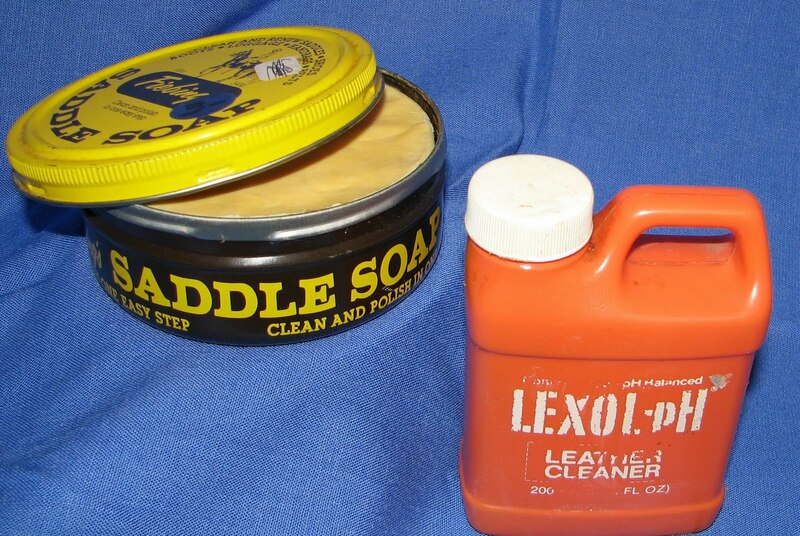 Some, such as paste-type or beeswax finishes, are for waxed leather only. If used on oiled leather, the same nastiness will ensue. Unsure if your item is oiled or waxed? Happily, there are products out there that will work with either. Lexol conditioner is an oil-based product that will penetrate wax; Leather Balm is a wax-based product that will emulsify with oil. It should be noted that some conditioners may permanently darken light-colored leather, so it's a good idea to test a small hidden area when using any product for the first time. Once the product has been selected, apply with a soft cloth according to the instructions. After allowing ample penetration time, wipe off any excess and buff with a soft shoe brush or lint-free cloth. Do not buy into the myth that you need to place the item near a heat source to open the pores so the conditioner can soak in: I've heard this many times, and it is bunk! Remember, heat is bad for leather! A good conditioner will offer a fair amount of protection against the elements. If you feel the need for a more waterproof finish, there are many excellent silicone spray treatments available anywhere that sells camping supplies. Check the label carefully to see if it is for full-grain or suede (some work for both) and use accordingly, with lots of ventilation! If you clean your leather when necessary and condition it occasionally, I promise you can love wearing it most of the time for years to come!